The Metropolitan Opera in New York will perform Mussorgsky's opera "Khovanshchina" describing one of the most robust and full-blooded episode of Russia's history. The Metropolitan Opera in New York has revived a 1985 production of Mussorgsky’s “Khovanshchina.” The libretto, written by the composer himself, focuses on various forces struggling for control over the way Russia should be – which prompts Russians today to shrug and say, “not much has changed since then. Khovanshchina is an opera in five acts written by Modest Mussorgsky between 1872 and 1880 in St. Petersburg. Like Mussorgsky's earlier Boris Godunov, "Khovanshchina" deals with 17-th century Russia. It portrays the rebellion of the opponents of the religious reforms, so-called Old-Believers, who were also against westernizing Russia. The opera portrays a lot of Russian historic characters including Tsar Peter the Great, who started Russia's westernization, Prince Ivan Khovansky, who orchestrated the rebellion, and the Streltsy troops, the old Russian guardsmen in the 16th-18th centuries. 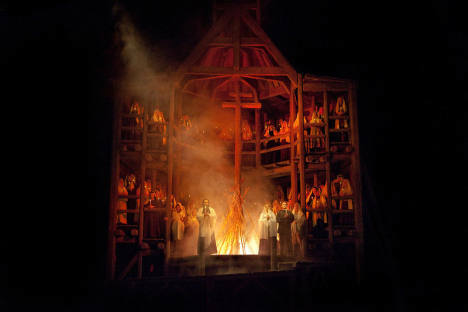 Peter succeeded in cracking down the rebellion as it was portrayed in the opera and Khovansky's followers - old-believers - committed mass suicide. Although the opera contains some historic inaccuracies, it reflects the major trends of the 17-th century when Russia was at crossroads. The four-hour opera is no trifling affair. Despite being illuminated by the love-triangle between Marfa, her philandering fiancée Andrei Khovansky and a German girl he is infatuated with, the plot centers around heavy-set men doing a lot of arguing and throwing their weight around. To top it off, it ends with a mass-suicide by a group of religious fanatics. The very capable conductor Kirill Petrenko organized the music so well that the four hours passed by quickly; he curtailed excess and kept a firm control over the robust chorus and orchestra. While this was the most palatable production of this (often-dreary) opera that I have ever seen, I had some reservations about the music sounding more like Rimsky-Korsakov than Mussorgsky. The opening prelude “Dawn on the Moscow River” was reminiscent of Rimsky-Korsakov’s epic fairy tale “the Legend of the Invisible City of Kitezh and the Maiden Fevroniya,” full of shimmering harmonies and idyllic melodies. Of course Mussorgsky’s music can be beautiful and sweet, but it also contains some bitterness and heaviness – after all, an omnipresent character in Mussorgsky’s operas is the Russian people, oppressed and burdened. Her fiancé Andrey Khovansky was played by Misha Didyk, who was one of the few weak links in the cast – his character portrayal lacked the depth of the other, more experienced members of the cast, he often forced his voice and did not have complete command over it. That said, he did not detract much from the overall performance – after all, Andrey is no hero but merely the arrogant son of a powerful man, and arrogant children of the powered and privileged elite today (perhaps particularly in Russia) still behave that way, thinking they can get away with whatever they fancy. Baritone George Gagnidze took on the role of Shaklovity, an ally of the young Peter the Great. His performance was solid, but he lacked some of the menace and depth of this character, which has some gorgeous and revealing moments in the opera. Tenor Vladimir Galouzine played Vasiliy Golitsin, a powerful statesman pushing radical reforms. Though past his vocal prime, he still brought passion and tension to the role of a man on the verge of seeing his lifework collapse. Dosifey, Khovansky and Golitsin argue endlessly among themselves; though they are all against the young tsar (Peter the Great), they cannot put aside their differences to join forces. Sound familiar? Some observers say that today’s opposition movement had, at least until recently, suffered a similar fate. Dosifey is against the new reforms of the church and chastises Khovansky for letting his streltsy guards roam the streets of Moscow terrorizing the people, but the latter, while clearly in awe of the priest, has only a basic understanding of religion and is focused on ruling Moscow by brute force and taking over the throne. Both want to take Russia back to earlier times, when the church was still undivided and the boyars had more power, but Golitsin is adamant that Europeanizing Russia is the key to its survival. Golitsin is eventually denounced and exiled, while Dosifey, surrounded by Tsar Peter’s troops, leads his brethren to a wooden monastery to burn themselves to death rather than surrender their beliefs. Mussorgsky never finished the work, but Shostakovich’s version is the one performed today, including at the Met. However, Petrenko made one important and very successful change; he used an earlier version made by Stravinsky for the finale. The chorus is definitely more Stravinskian than Mussorgsky, but it is hauntingly beautiful and provides a much more luminescent ending as it fades away into nothingness.